The most trusted multi-use agent for degreasing, moisture protection and cleaning. WD-40®’s ultra-high surface attraction assures the lubricating ingredients in WD-40® will be widely dispersed and tenaciously held to all moving parts. WD-40® contains no silicon or other additives that attract dust and dirt causing a build of gummy, greasy residue. WD-40®’s ultra-high surface attraction results in a super penetrating action that loosens rust-to-metal bonds and frees stuck, frozen, or rusted metal parts. 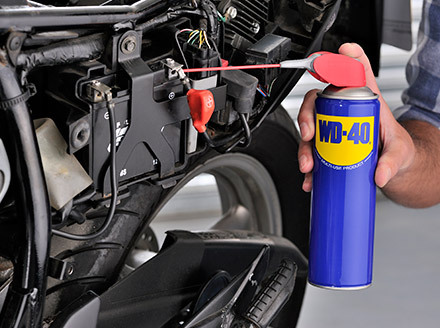 The lubricating properties of WD-40® then keep these parts working freely. WD-40® dissolves most adhesives, allowing for the easy removal of labels and excess bonding materials. Its ultra-high surface attraction enables it to get under dirt, grime, caked grease and oil to clean the surface, and at the same time, forms a corrosion-resistant barrier. WD-40® protective barrier shields against moisture and other corrosive elements. It deposits corrosion-resistant ingredients over the entire surface area, including microscopic irregularities. This WD-40®’s moisture displacement capability also prevents the possibility of a small moisture pocket which can cause future problems. WD-40® is a non-conductor of electricity and quickly eliminates moisture-induced short circuits. WD-40® is formulated for ultra-high surface attraction to metal. It completely covers surfaces, including microscopic irregularities, even in the presence of moisture. In fact, WD-40® goes under surface moisture and establishes a protective barrier between the moisture and parent metal.